Welcome to the still-under-construction online store for Freights artware. We're working hard to get our store up and running so you can see and buy Freights online. In the meantime please contact us for individual or wholesale orders and inquiries. We can send you photos and prices via email. Add your name to our e-mail list and we'll let you know when the online store is open for business and where else Freights can be found. 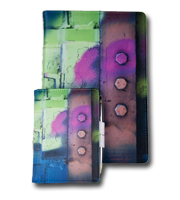 Freights artware is a line of colorful, practical gifts and accessories dye-printed with the photographs of Lorenzo Kristov. His freight train photos capture the surprising beauty found in the interplay of freight car hardware with the effects of weathering and graffiti. BAGS -- We offer seven different styles and sizes of bags including rugged messenger bags, sleek book bags, handy shoulder bags, purses and totes. Bags are made of black microfiber, are fully lined and feature zippered pockets and compartments. 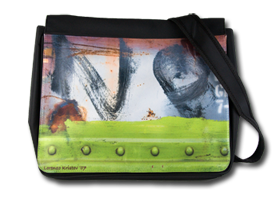 On several of our bag styles the image is printed on a removable flap, so you can buy additional flaps and change the image whenever you feel like it. Bags range in price from $40 to $80. 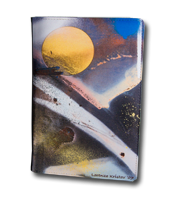 BOOKS -- We have three sizes of plush, fabric-covered hardbound blank books, available lined and unlined, for use as notebooks, journals, sketchbooks, and memo books. When you fill up a book, the printed cover can be removed and refilled with a new paper insert. Books range in price from $18 to $30. 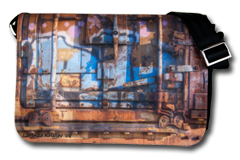 COMING SOON -- Freights laptop cases ... mugs ... silk pillows ... metal wall art. Each fabric-covered bag or book is set up by hand and printed one at a time using a dye-sublimation process that permanently bonds the image with the fabric. With over fifty images to choose from, we only print a few of each item with the same image, and only reprint that image when the first ones sell out. 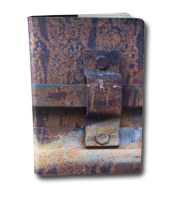 So when you buy a freights bag or journal, you may be the only person with that image on that item. We're happy to do custom orders -- the items of your choice printed with your favorite images -- so browse the photo gallery and let us know what you want! Where can you find Freights? 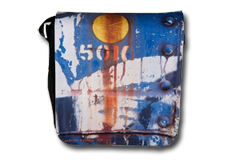 Freights "art for the long haul" is a collaboration between Lorenzo Kristov and Robin Kozloff. Lorenzo is the visionary with the photographic eye who thought his freight train photos would look cool on messenger bags and that people would like them. 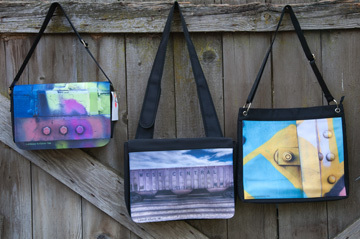 Robin styles his images to the artware items and handles marketing and sales. We're just getting started, so tell us what you think!